9 different noodle molds to make your favorite noodles or pasta. Durable thick stainless steel barrel, pressure panel, and handle. Cast iron rotating screw bar to ensure long-lasting repeated uses. Comfortable and ergonomic rotating handle. Also, works as a fruit juicer! Perfect gift for noodle or pasta aficionado. Do you, or someone you know, love to make your own noodles or pasta? 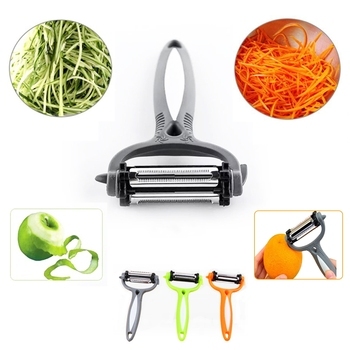 This cool pasta press machine allows you to make up to 9 different noodle shapes and thickness, so feel free to experiment with all of them! Easy to use – simply unscrew and change the mold that you want, put in your noodle or pasta dough, turn the handle and watch beautiful stands of noodle coming out from the mold. Easy to clean – simply take the machine apart and wash with soapy water, and it’d be ready for your next pasta-making session. Did we mention that this machine is also a juicer? Try peeling some oranges and use this juice presser and you’d get some fresh and most delicious orange juice!